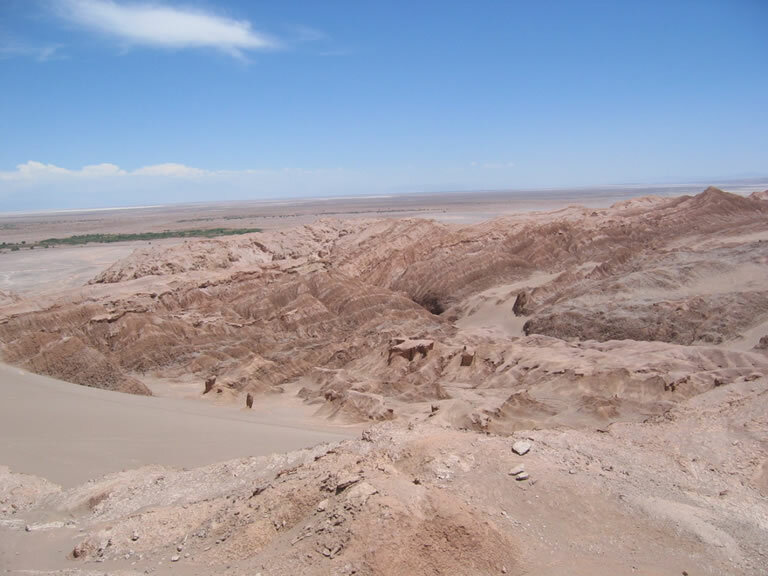 Not wanting to spend more time in San Pedro, we headed out to the Valle de la Luna. Yes, another Moon Valley! (Apparently throughout South America, wherever the rain and wind have eroded the rock into these moon like landscapes, the area is named Valle de la Luna.) The drive is not too far out of town - just 15km - and you can drive in a circuit through the desert landforms. The area is a lot bigger than the valley we had been to near La Paz, Bolivia, and the views were great. 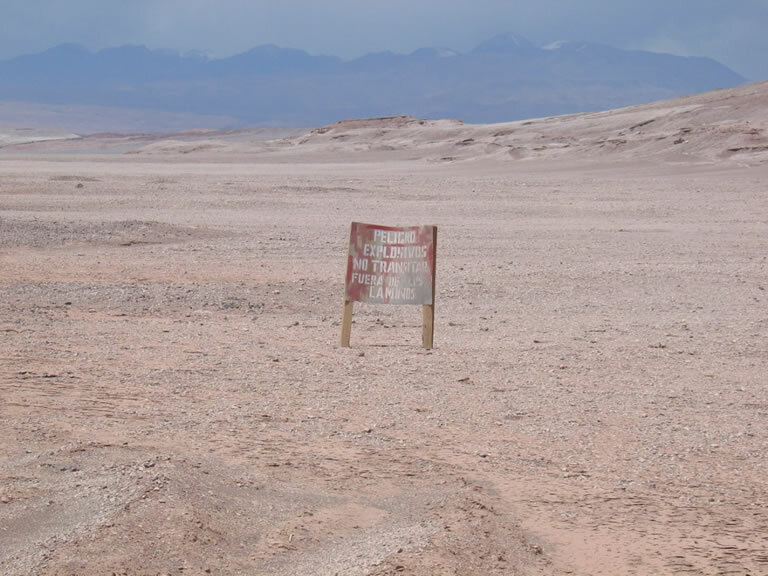 We went off one of the small quebradas, or box canyons, to explore a bit more, but refrained from driving across the flat desert landscape, partly because we didn't want our tracks to mark the sand and partly because we had come across a warning that there were landmines off the road! 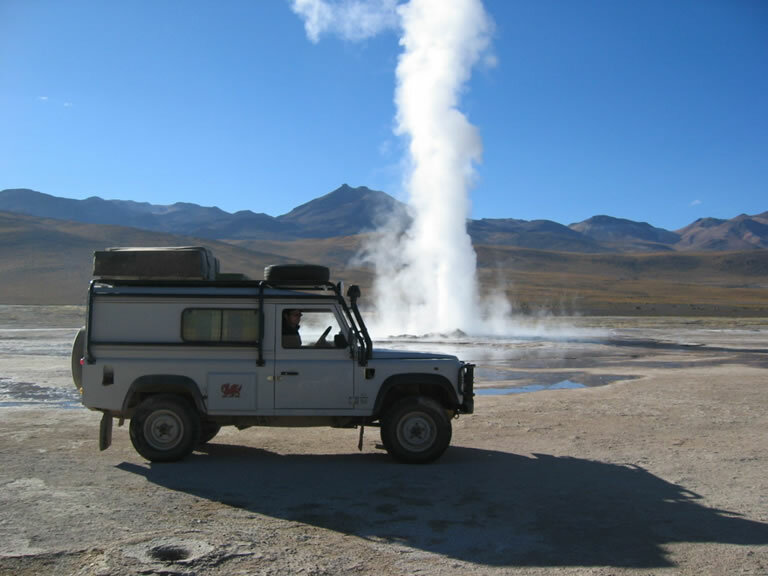 We then drove up to the El Tatio geysers, the highest geyser field in the world, and about 95km north of San Pedro. The best time to see the geysers in their full glory is 6:00am, as by 8:30am the morning winds have started to disperse the steam. Our plan was to camp there the night, get up at the crack of dawn, and enjoy the geysers at the best time of the day in peace and quiet before the tour groups arrived at 6:30am. When they arrived we could move on. 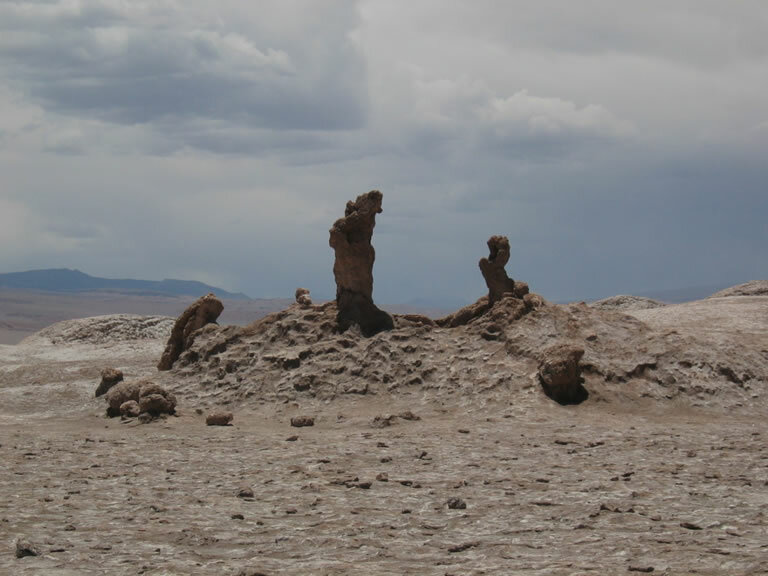 It was a long drive to the geysers, along a steep, winding mountain road and then through desolate landscapes, crossing a couple of fords before arriving at El Tatio itself. We soon forgot the hot temperature of San Pedro as we climbed in altitude from 2440m to 4300m - it got colder and colder and the winds picked up. Great for camping. We arrived at El Tatio around 5pm and apart from a police car and a pick up truck, we were on our own. The police car stopped to check where we were going, thinking we were mad to consider camping at this altitude, and then drove on. The pick up truck was not far behind. 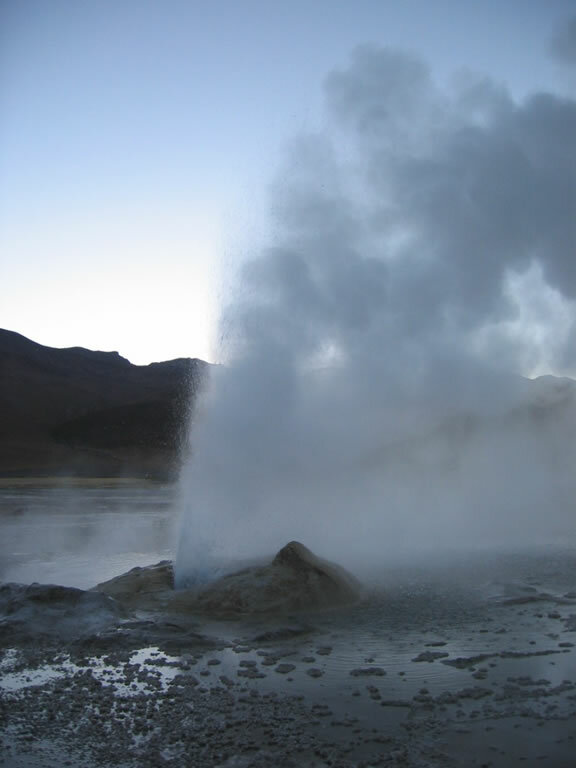 There are a great number of geysers of varying sizes and little steaming pools and fumeroles dotted around the landscape. We explored on foot for a while, and thought about where we would camp. We were tempted to camp right by the natural thermal pool which was fed by the geysers, have dinner and then a dip whilst gazing up at the stars, but Ed stuck his hand in the water and decided it was a little too tepid with the cold temperature outside, so we decided to give it a miss. Far off in the distance, we could just make out another car that looked like the camperwagon of an Austrian couple we had met at our campsite in San Pedro. They had tried to come up to the geysers the day before but had been unable to manage the steep ascent in their camper, so had turned around. They said there were going to try to come up another road which was less steep. But it turned out to be a different wagon and a German couple. We had a quick chat and then set up camp in the parking area next to the geyser field, with great views of the geysers as they bubbled away and threw up their steam every now and again. The alarm was set for 5am and off we went to bed, wrapped up in sleeping bags and thick blankets and looking forward to seeing more activity from the geysers in the morning. As it turned out, there was no need to have set the alarm - we were woken up around that time by loud voices outside. At first we thought is was the German couple but there were a lot more voices than just two people. Peeking outside the tent we could see that we were surrounded by vehicles of tourists, who had come up to see the geyser field. So much for having the place to ourselves. We couldn't work out why they were all here so early. It only dawned on us a little while later that when we crossed the border into Chile, we forgot about the time change - Chile was an hour ahead of Bolivia! We still had a wander though, cooked up some breakfast and then headed off after most of the tour groups had left.